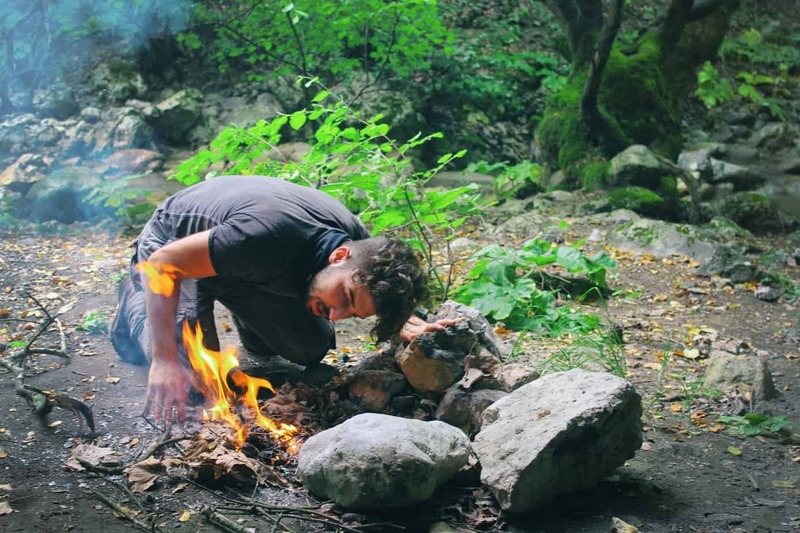 Ultralight backpacking in your weekend trips, specifically packing ultralight, is a skill of its own. The search for finding what you can go without and how to drop weight on necessary items to build the perfect gear can be a very in-depth topic. However, one piece of gear you can’t go without is with one of the best ultralight backpacks. The struggle with finding an ultralight backpack can be very frustrating that you might feel like a weight in your shoulder. Often times packs either aren’t supportive enough or don’t have enough space for all your gear. The weight of the backpack itself is, of course, another obstacle when hiking. When it comes to shopping for the best ultralight backpacks, there are a few things to consider to get that perfect lighter pack. Logically, the larger the backpack, the heavier it will be. One of the main problems encountered when trying to find an ultralight pack is one that is small and light enough for your hiking purposes while still being roomy enough inside for your weekend trips. You’ll also need to know if the fabric or shoulder straps of the pack will be able to hold and carry all of your own gear during your hike. As the market evolves, more and more products are being manufactured for ultralight backpacking. You’ll, of course, want the main pack area to be roomy, but what about other storage options on the pack? Or how many external pockets do you need? A good ultralight backpack will have plenty of pockets on it and within it to help you organize everything you need to carry during your hike. Also, consider whether you’ll be packing a sleeping bag or not. Even though the sleeping bag storage adds more weight, it might be better to go for it anyways if you plan to do overnights has a hiker often enough to warrant the price. A frame can add a significant amount of weight to an ultralight backpack. If you aren’t hiking for long distances or carrying a lot of gear you will probably be fine without a frame on your pack. If you are hiking long distances and plan to carry enough gear for overnight sleeping or a few days, you’ll need a frame to protect your back and shoulder. Both internal and external frames work but external frames are pretty much disappearing from the backpacking market. The Osprey Hornet 46 pack is one of the most durable backpacks compared to its weight and durability. The Hornet is lightweight and extremely versatile for short trips. You can find the Hornet ultralight pack in two different volume capacities but both weigh in at around 18oz. Due to the lightweight, there is less padding and not an actual frame. Instead, there is a back pad along with a Delrin two-rod system. There is no noticeable lack of stability without a frame so you don’t have to worry about back or hip pain. For carrying lightweight loads, 35lbs or less gear, this shouldn’t matter much but it may be uncomfortable if you over pack. The pack comes with a built-in BioStretch harness which is very comfortable. The backpack has plenty of storage and pockets that have a stretchy fit yet secure. The Hornet also has a built in hydration pouch which is a great feature for any hike. Since it is built in you don’t have to worry about sacrificing space for your own. If you need a backpack that is lightweight but roomy, the Osprey Hornet 46 ultralight pack will not disappoint. GoLite Jam 50 ultralight pack not only has an incredible performance rating but also is super affordable. The affordability alone makes this backpack the perfect introduction to ultralight backpacking without fear of breaking the bank in case it turns out to not be your kind of hobby or your not that type of hiker. Don’t think this is just a beginner’s backpack, however. The Jam 50 has been tested repeatedly and proved to be one of the best ultralight packs out there, period. Like many other ultralight backpacks, the GoLite Jam 50 has a 35lb carrying capacity for your mountain gear. The backpack weighs only 1lb 14oz and can easily be filled to the top without worrying about the weight. The backpack is frameless and instead has a flexible yet sturdy closed-cell foam back panel. These panels are flexible enough to move with the body but offer enough stability with the hip belt. The Jam 50 ultralight pack has a built-in hydration sleeve so you don’t have to use cargo room for a bladder. The mesh pockets on the pack are able to hold fairly heavy objects without failing. For further storage, the hip belt also has built-in pockets which are perfect for objects you need to be able to reach easily like snacks, a cellphone, maps, GPS, or other mountain gear objects. The backpack closes with a drawstring and has an extension collar. If you’re looking for a backpack that is really roomy without sacrificing weight, the Mountain Laurel Designs Exodus FS ultralight pack is a perfect choice. This backpack has a large capacity and is very comfortable to wear for long periods of time. The Exodus FS will allow you to carry up to 35lbs and hike for about 10 miles without issue. This backpack has the premier framing fabric: carbon fiber. The carbon fiber frame gives stability without much extra weight and ensures the hiker is comfortable for a long period of time while hiking. The Exodus FS ultralight pack also has further support in the form of an inflatable mattress pad sleeve in the back panel. The mattress padding comes with complimentary with the backpack itself. Mountain Laurel Designs outfitted this backpack with a strong, scratch resistant shell made from 210-denier so you won’t have to worry about going through brush. Storage-wise this pack has side pockets and a large front pocket along with compression straps. You can opt for additional storage pockets if needed. The Mountain Laurel Designs Exodus FS ultralight pack is perfect for backpackers that go on long trips and need a bag that has plenty of room without a lot of added weight. Due to the back pad, the pack is best used in temperatures in the 70Fs and cooler. The backpack weighs 17oz depending on whether you add additional features like pockets and carries about 50 liters. There are extended collar options for additional space. The Gossamer Gear Gorilla is one of the most adaptable ultralight backpacks on the market today. This backpack gives you the option of using all the features of the pack or removing some you don’t need to save space and weight. With all the extra features removed, this backpack only weighs 15oz. 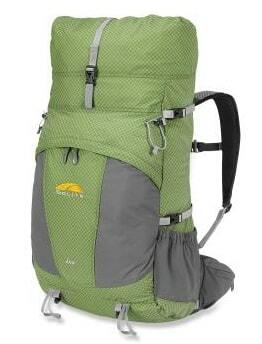 It also is great for day trips or overnight trips with small weight loads of 15lbs or less. If you are needing to carry more than 15lbs, don’t worry. Just add some of the key features back on. This includes an aluminum stay and a foam back pad. Additionally, there are close-cell foam strips which slide into the shoulder straps and hip belt for added comfort and durability. With all of these things added back to the backpack, the weight is then raised to about 32.8 oz. After the extra stability is added, you can comfortably carry upwards of 25lbs. The Gorilla backpack is made from rip-stop nylon, 210-denier, which is also urethane-coated for added durability. The pack has plenty of mesh pockets that stand up very well to brush, rocks and general wear and tear. The capacity is around 46 liters and it comes in 3 sizes. 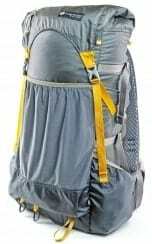 Zpacks Arc Blast is a great ultralight backpack for hiking in warmer weather due to one very cool feature. The Arc Blast has a specially designed carbon fiber frame that allows your back to breathe during hiking. A common issue with ultralight packs is how sweaty they can make your back. This isn’t the case with the fit of the Arc Blast. The frame itself is made from carbon fiber that is comfortable enough to not require additional padding on your part. An additional benefit of not having built-in padding is that you have space to store an inflatable mattress if you use them. You won’t have to deal with too much padding like you would with packs that have a permanent pad. Overall the ZPacks Arc Blast is wonderfully simple, and definitely one of the best ultralight backpacks in its design which saves time when it comes to packing your bag. The straps and hip belt are very comfortable for short trips and both have built-in pockets for additional storage. You can also add additional hip pockets for extra room. As an added benefit, these pockets are completely waterproof so you can store electrical devices for example without fear of damage. Zpacks offer other customizable options on their website. Like most ultralight backpacks, it isn’t recommended to carry heavy loads while hiking but rather keep the weight at 30lbs or less, but it is still a overall lighter pack with a great durability. Overall, at only 16.4oz the Arc Blast is super lightweight and extremely comfortable. Ultralight packs are often a headache when it comes to finding one suitable for your hiking purposes or trips and that is durable at the same time. If you are in the market for the best ultralight backpacks or want to try out ultralight backpacking as a hobby, check out the above 5 packs. Most can be purchased at their respective brand websites or on online stores like Amazon. Ultralight backpacking hiking trips is an enjoyable hobby for everyone and is a great way to explore different scenery on-foot.